The first half of the twentieth century saw a gradual decline in Crovie's fishing fleet in the face of competition from the larger, more effective vessels that could operate from other ports. 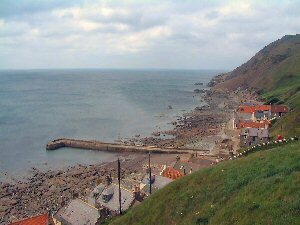 However, the end of Crovie's fishing industry came, finally and abruptly, on 31 January 1953. A storm that had been building since the previous night brought hurricane force winds and huge seas to the village. The path to Gardenstown was washed away (it has since been replaced), together with stretches of Crovie's sea defences and a number of houses and sheds. The village ceased to be viable almost immediately, and many residents simply moved round the bay to Gardenstown. As many as 60 fishing vessels had worked out of Crovie until the "big breeze". Crovie was left largely to be developed as holiday lets, and today it is a much more active place in the summer than at other times of the year. The restrictions placed by its location on development throughout its history, plus the sudden halt to any commercial activity in 1953, have left Crovie as one of the best preserved fishing villages in Europe. The pier at Crovie is still used by small boats and it has a vital role as a breakwater to help prevent the sea sweeping into the houses that sit just yards from the shore. The pier was first built in the mid nineteenth century but was destroyed by a storm in 1906, by which time the village had grown to 300 residents in 66 cottages. As builders worked from a coble to restore the pier in February, 1906, the Newcastle steamer Vigilant ran aground in a gale. Four local fishermen heroically rowed out in the coble to rescue the crew. A cairn was erected in Crovie on 11 February 2006 to commemorate the 100th anniversary of the rescue.